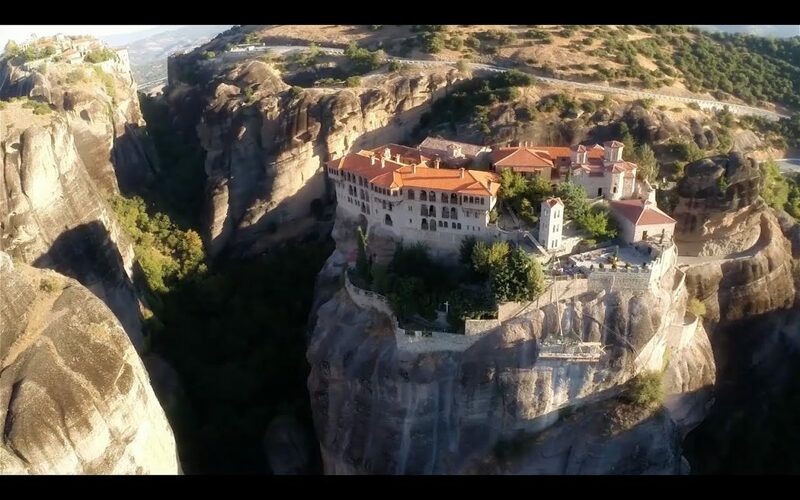 The most important monasteries of Meteora are:- The Holy Monastery of Great Meteoron. It is the biggest of the Meteorite monasteries. The church ‘Katholikon’, honoured to the ‘Transfiguration’ was erected in the middle of 14th c. and 1387/88 and decorated in 1483 and 1552. The old monastery is used as a museum, nowadays. – The Holy Monastery of Varlaam is the second, after the Great Meteoro, big in size monastery. The church, honoured to the three Bishops, is in the Athonite type (cross-in-square with dome and choirs), with spacious esonarthex (lite) surrounted by dome as well. It was built in 1541/42 and decorated in 1548, while the esonarthex was decorated in 1566. The old refectory is used as a museum while North of the Church we can see the parekklesion of the Three (Bishops) built in 1627 and decorated in 1637. – The Holy Monastery of St. Nicholas Anapausas. It is the first to meet on our way from Kastraki to Meteora. The ‘Katholikon’ dedicated to St. Nicholas, is a single – nave church with small dome, built in the beginning of 16th c. It was decorated by the Cretan painter Theophanis Strelitzas or Bathas, in 1527. – The Holy Monastery of St. Stephen. It is one of the most attainable as we don’t have to cope with innumerable stairs to reach it. The small single-nave church of St. Stephen was built in the middle of 16th and decorated in 1545 or a little later. The ‘Katholikon’, honoured to St. Charalambos, was built in the Athonite type, in 1798. The old refectory of the convent is used as a museum nowadays.